Did you know that the Southern Crested Screamer screams because it sees ghosts? Me either...but thanks to comedian, Obvious Plant (otherwise known as Jeff Wysaski ), visitors to the Los Angeles Zoo were recently enlightened of that fact. They also learned about a cheating flamingo, meerkats with the ability to telepathically control electronics, and the TRUE identity of our nation's first president. 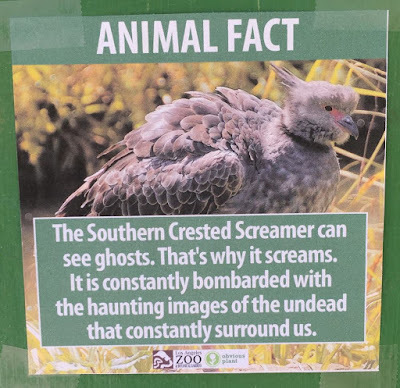 The signs, posted throughout the zoo as a joke, quickly went viral...with a little help of Jeff, himself. That's a good thing, though. Now we can ALL get a lil' more educated on why owls love the theme from Friends, what would happen if you give 76 ducklings trombones, and other important pieces of data! For a collection of these important images, check out the Facebook page linked above, or go to THIS ARTICLE.